Gone are the days where a student can pay for an entire year of college from a summer job at McDonalds, and according to some students at the University of Rhode Island who pay for school themselves, it is becoming even more of an uphill battle. About 70 percent of students at URI receive some sort of financial aid, whether it be a loan, grant or scholarship. Debt in the United States is at an all-time high, but students like senior communication studies major and business and public relations minor Surya Moreira are using options available to them to help ease the burden. Sophomore computer science major Timothy Moran is also taking advantage of chances to save money by joining the National Guard and taking out subsidized loans. Every semester, Moran accepts his loans and turns in his tuition waivers from the National Guard. Besides that, he has no interaction with Enrollment Services, which provides academic and financial services to current and former students and sometimes faculty. Director of Enrollment Services Carnell Jones, who is in his third year at the helm of the department, has been combating this problem by implementing an open-door policy where students can walk in at any time without an appointment. The department’s calling center also receives about 130,000 calls a year, the most of any branch at URI. 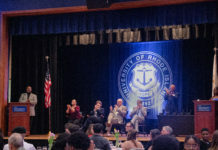 Of the five colleges he’s worked at, Jones said that URI is one of the best he has seen when it comes to informed students and families paying bills they owe. Though balancing academics and paying for school is tough, Jones said that he feels compassion because he was once in the same position as a student paying for school himself. He worked two jobs, had to turn full paychecks over to his school and was in need of financial assistance throughout. He gives his personal business card with his direct line to everybody that walks through his office and also said he is personally invested in the students at URI even if it is a gamble. Many students agreed that the cost of college is more of a burden than a help, but personally investing in one’s education does have its benefits. Sophomore communication studies and public relations double major and writing and rhetoric minor, Rachel Ricci said it gives her more drive to excel. A solution remains to be seen, but Jones said he and his staff will continue to do all they can to make sure students are informed about options that will help them pay for school. His main piece of advice is for students to stay realistic, even if their dreams feel so close and attainable and to stay positive.